Thousands of students across East Bristol and North East Somerset are celebrating today after receiving their A-level results. At St Brendan’s Sixth Form College at Brislington, pictured left, which draws students from across B&NES, South Gloucestershire, Bristol and North Somerset, a total of 1,597 A-level subject exams were taken this year with a 96.4 per cent pass rate. 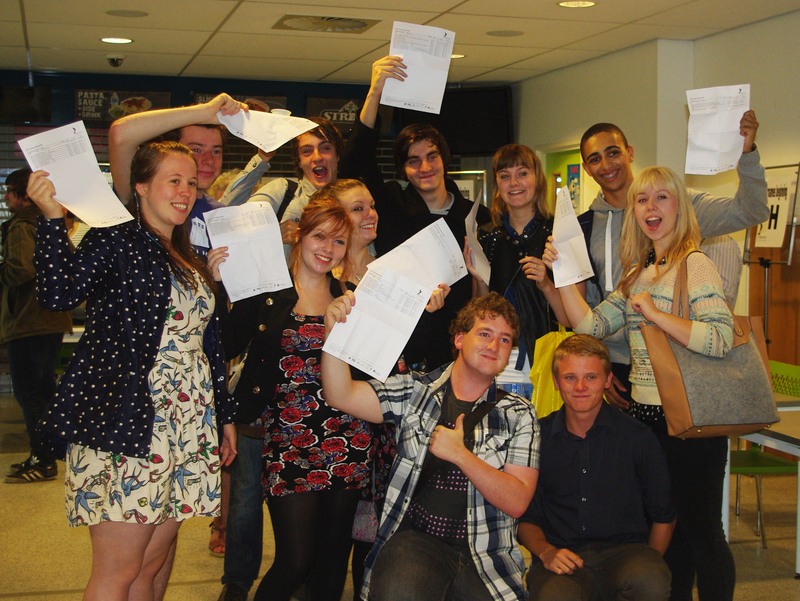 Almost 40 per cent achieved A* and B grades which is 2% higher than last year. AS-level results were again good, with a 89 per cent pass rate, with over half of the students achieving A* – C grades. In 52 subjects there was a 100% pass rate. Twenty students are toasting the fact that they have been awarded A*s or A grades for three or more of their A-level subjects. 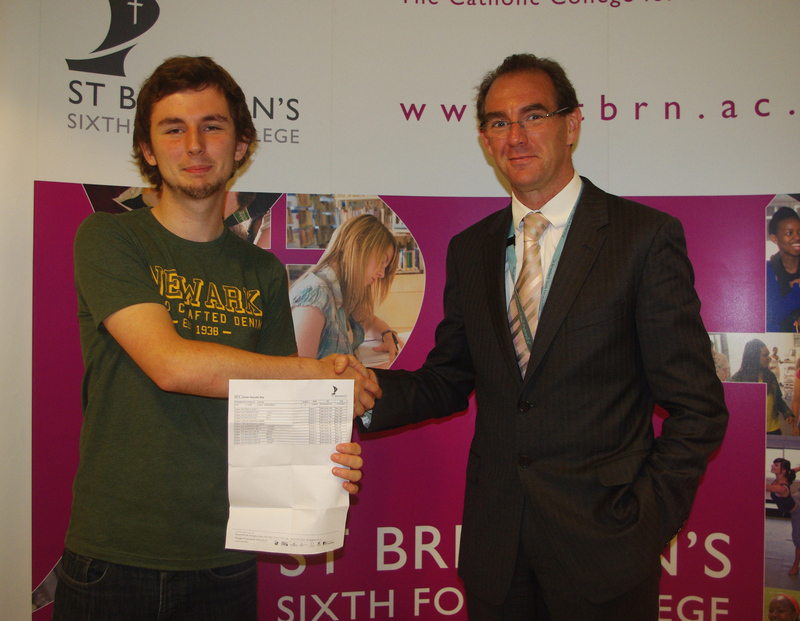 Among them is James Easton from Keynsham, who went to St Brendan’s after taking his GCSEs at Broadlands. He achieved an A* in chemistry and A grades in physics, biology and maths. He will now be heading to Southampton University to study chemistry. Meanwhile two of the 120 students picking up their results from the John Cabot Academy in Kingswood were interviewed on Radio 5 Live. Reporter Rowan Bridge spoke to students Connie Bray and Kayleigh Guy, pictured left, who were both delighted to get the grades they needed to go on to study at the University of the West of England. 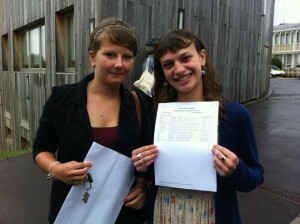 Principal at the academy, Jon Angell, said students were off to universities including Cambridge and Loughborough. At Downend School more than half the year group beat their personal targets. Amir Salehilashkajani achieved the highest results, with five A-levels – one an A* and the others As. Headteacher William Roberts said: “We are very proud of the success of all our students. Their achievements reflect the determination and commitment they have shown during their time at Downend. He said the most improved schools were King’s Oak Academy in Kingswood, Sir Bernard Lovell School in Oldland Common and Yate International Academy. In terms of overall results, the highest performing schools were Castle School Educational Trust in Thornbury, Winterbourne International Academy, Bradley Stoke Community School and Abbeywood Community School in Filton. Cllr Ian Blair, chair of the Children and Young People Committee, said: “Early indications are very promising and overall it has been a very positive day for the young people receiving their A-level results in South Gloucestershire. These results reflect the hard work of our young people and, of course, of the staff who work in our schools.